Serbia led at the time after Dusan Tadic's early penalty but the hosts equalised through a spectacular 25-yard strike from Danilo Pereira. 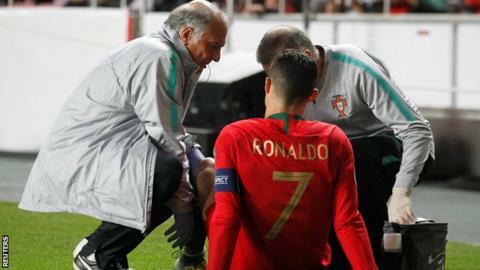 "I'll know more in 24 or 48 hours," said Ronaldo. "It happens. If you go out in the rain you get wet. I'm calm, I'll be back in one or two weeks." His club, Juventus, are 15 points clear at the top of Italy's Serie A and face Ajax in the Champions League quarter-finals. Portugal thought they had a penalty when the referee pointed to the spot after the ball hit the outstretched arm of Antonio Rukavina from Andre Silva's close-range header. Match ends, Portugal 1, Serbia 1. Second Half ends, Portugal 1, Serbia 1. Pizzi (Portugal) wins a free kick in the defensive half. Attempt missed. Pepe (Portugal) header from the left side of the box misses to the right. Assisted by Bernardo Silva with a cross following a corner. Corner, Portugal. Conceded by Sergej Milinkovic-Savic. Attempt blocked. Bernardo Silva (Portugal) right footed shot from the right side of the box is blocked. Attempt blocked. Pepe (Portugal) header from the centre of the box is blocked. Assisted by Pizzi with a cross. Corner, Portugal. Conceded by Nikola Milenkovic. Attempt missed. Raphael Guerreiro (Portugal) left footed shot from the left side of the box is close, but misses to the left. Assisted by Gonçalo Guedes. Hand ball by Sergej Milinkovic-Savic (Serbia). Substitution, Serbia. Sergej Milinkovic-Savic replaces Adem Ljajic. Dusan Tadic (Serbia) is shown the yellow card. Bernardo Silva (Portugal) wins a free kick in the attacking half. Foul by Gonçalo Guedes (Portugal). Andrija Zivkovic (Serbia) wins a free kick in the defensive half. Attempt blocked. Bernardo Silva (Portugal) left footed shot from the centre of the box is blocked. Assisted by Raphael Guerreiro. Substitution, Portugal. Gonçalo Guedes replaces Rafa. Attempt blocked. Pizzi (Portugal) right footed shot from the right side of the box is blocked. Assisted by Rafa. Corner, Portugal. Conceded by Antonio Rukavina. Attempt blocked. Bernardo Silva (Portugal) left footed shot from the left side of the box is blocked. Assisted by Pizzi. Attempt saved. Raphael Guerreiro (Portugal) right footed shot from outside the box is saved in the centre of the goal. Uros Spajic (Serbia) is shown the yellow card for a bad foul. André Silva (Portugal) wins a free kick in the attacking half. Foul by Uros Spajic (Serbia). Attempt missed. João Cancelo (Portugal) right footed shot from outside the box misses to the left. Assisted by William Carvalho. Filip Mladenovic (Serbia) is shown the yellow card for a bad foul. Foul by Filip Mladenovic (Serbia). Attempt missed. Andrija Zivkovic (Serbia) left footed shot from outside the box misses to the left. Attempt blocked. André Silva (Portugal) header from the left side of the box is blocked. Assisted by Pizzi with a cross. Attempt missed. Dusan Tadic (Serbia) left footed shot from outside the box misses to the left. Assisted by Nemanja Radonjic. Attempt blocked. William Carvalho (Portugal) right footed shot from very close range is blocked. Attempt blocked. Pizzi (Portugal) left footed shot from very close range is blocked. Assisted by Bernardo Silva.